apples | What's not to like? Before the really big Food Day is upon us, I’d like to share some glimpses of Food Day 2015 at Julian Elementary and Julian Junior High. It was a minimum day, and we had 15 workshops between the two campuses. Students went to 5-6 of them for thirty minutes each. It was too wet and windy to hang it in front of the school as planned (along with two huge banners that read “Eat a Rainbow Every Day!”) so it became a nice backdrop for a storybook and craft session on the importance of eating foods of all different colors for a healthy diet. The UC Farm Smart joined us for the third year running, and as usual, they delivered a visual, hands-on, super engaging lesson. This year’s topic: carrots. 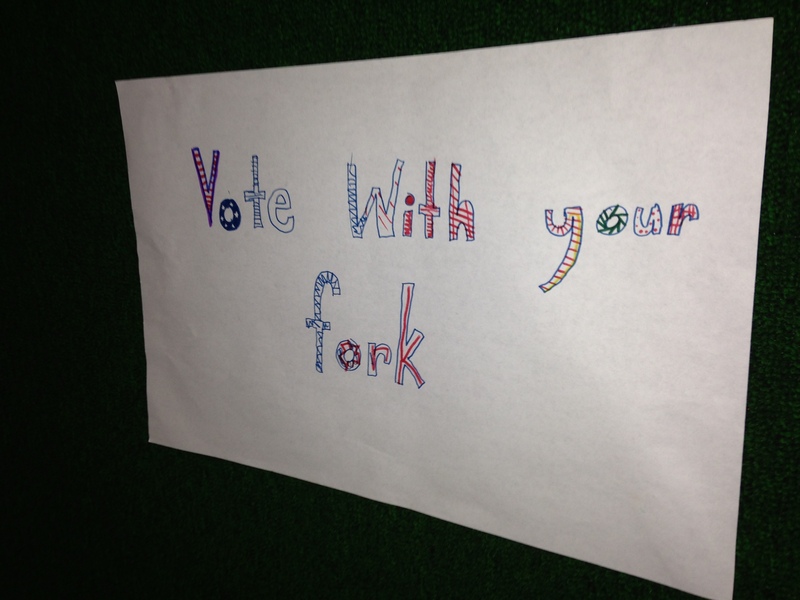 Students used orange dots to conduct a poll after a taste test: fresh carrots, canned carrots or no carrots at all. Another wildly popular instructor, Chef Greg from Healthy Adventures Foundation taught kids how to make vegetarian sushi. 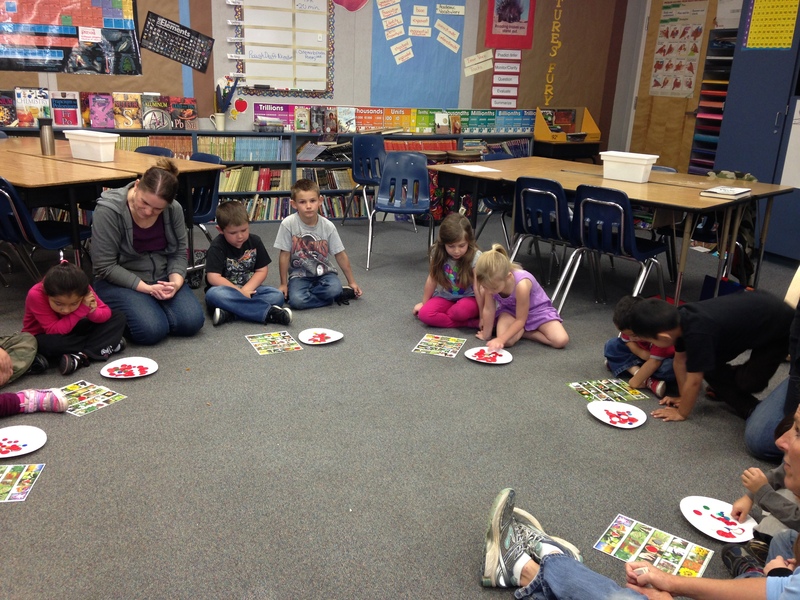 A superteam of teachers, present and former (Lark, Nancy, Kathy, Shirley) presented lessons on “eating a rainbow.” A mini-lesson on the health benefits of each color was followed by fruit and veggie bingo and fruit kabobs—kids that ate all the colors left with a little rainbow sticker on their shirts. Food Day would not be Food Day without Teak and Harvey representing for the Julian Apple Growers with apple pressing for juice and apple slice taste tests. The amazing folks from Camp Stevens led a composting workshop, demonstrating their teaching flexibility by switching from the garden to the cafeteria when it started to pour, hauling in mounds of unsifted compost and wheelbarrows. Not pictured: Ann from the Resource Conservation District teaching a lesson about monarch butterflies and the importance of protecting pollinators. From the mind of our ag specialist, Mr. Martineau: Students walk through eight stations, tracing all of the parts of a pizza to their origins and making little pizzas as they go. Each station had information, questions and a short video about the bread, sausage, tomato sauce, etc. Presenting the Duffy Cooking Show! How cool is it that kids were making homemade granola bars with their principal and superintendent? Mrs. Hill and Mrs. Tellez pulled off an amazing workshop on cheese: a history of cheese, cheesemaking, cheese tasting/rating and looking at yogurt under the microscope. 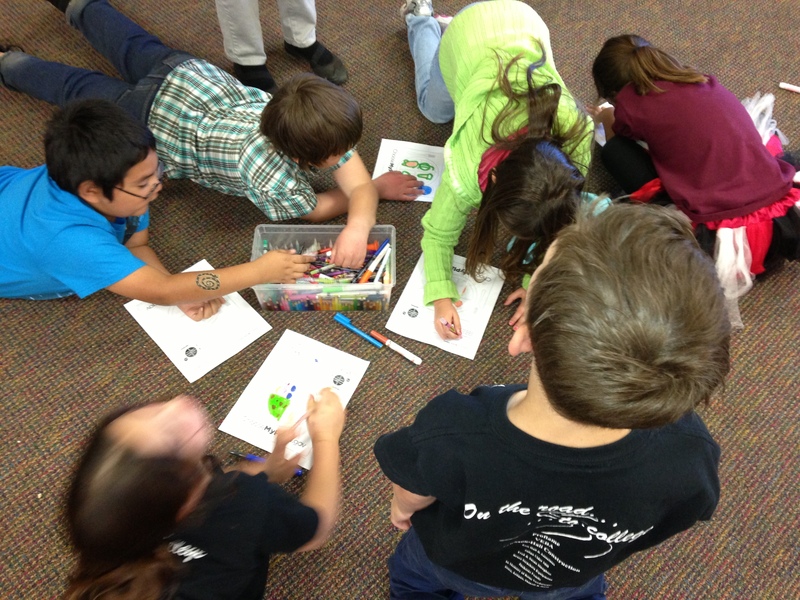 Every student did an art project with Sun Dog Studios. See last post. Students had a chance to talk to Joel and Chef Jeremy, who plan and cook their school lunch. Joel and Jeremy talked to the kids about the mechanics and nutrition involved in planning a NSLP-approved lunch, and students provided them with feedback about the menu. Not pictured: Students watched 5 short videos from the very cool video series How does it grow? All that, and we fit in an apple crunch on both campuses! Later that day, afterschool students toured Mom’s Pies and each made an apple dumpling…. Thanks to all who contributed to this truly awesome day of learning! See you next year. 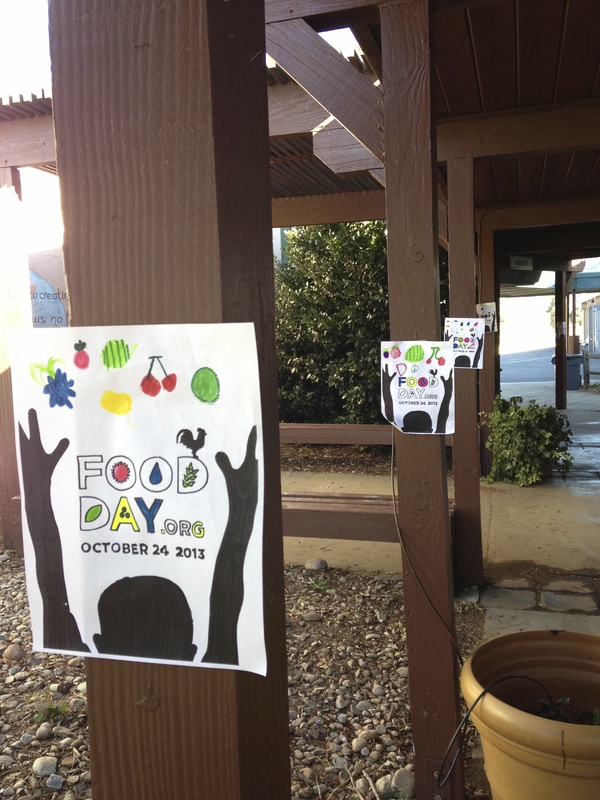 Food Day: An educational feast! The following article will appear in next week’s Julian News. Great photos follow after the story! Joining with individuals, schools and cities across America, Julian Elementary School celebrated its first National Food Day on October 24th. From 9:00 to 2:00, K-5 students were treated to eight different workshops spread across campus focusing on food, agriculture, cooking and nutrition. Simply put, students and staff ate it up. All sessions were experiential, interactive and expertly taught by a team of volunteers. 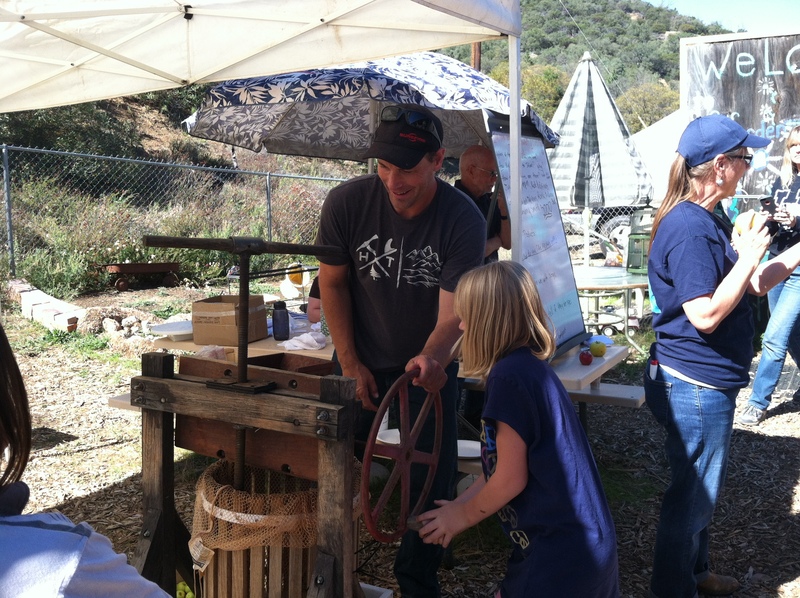 Representing the Julian Apple Growers Association, Mary Prentice and Teak Nichols related the history of the apple while having the students press their own cider. Josh Rasmussen, from Down the Road Farm, led students in a planting activity as well as brought farm animals for the kids to enjoy. 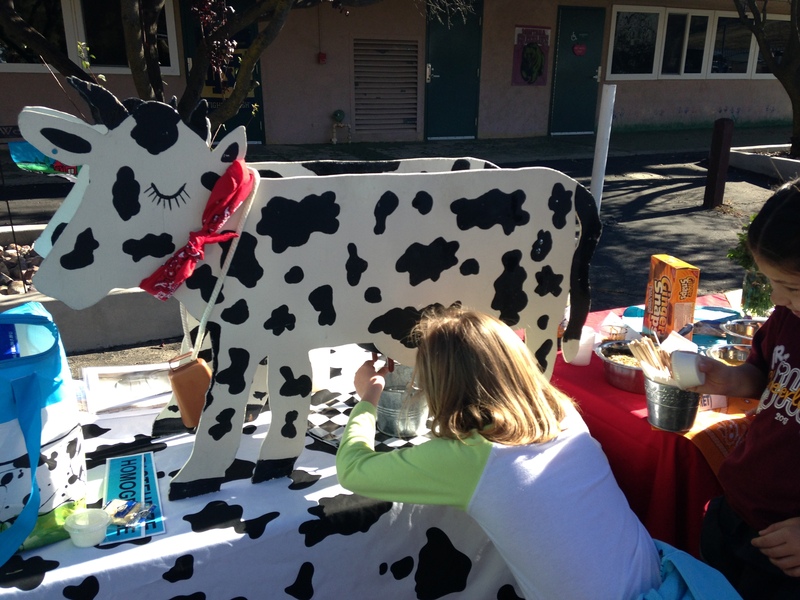 Farm Smart, a program of the UC Desert Research and Extension Center, lent us Stephanie Collins for a wonderful program that included churning butter, comparing animal feed, and milking Bessie, a wooden cow equipped with an inner stainless steel container filled with real milk. Camp Stevens staff Ryan Wannamaker and Correen Walsh captivated kids in the garden with pollinator games, honey tastings and dressing up as beekeepers. Led by Tricia Elisara and Gina VanderKam, students played vocabulary-rich “Garden Bingo” and interacted with the outstanding documentary film “Nourish” about global food issues. Cooking was another key ingredient of the day. 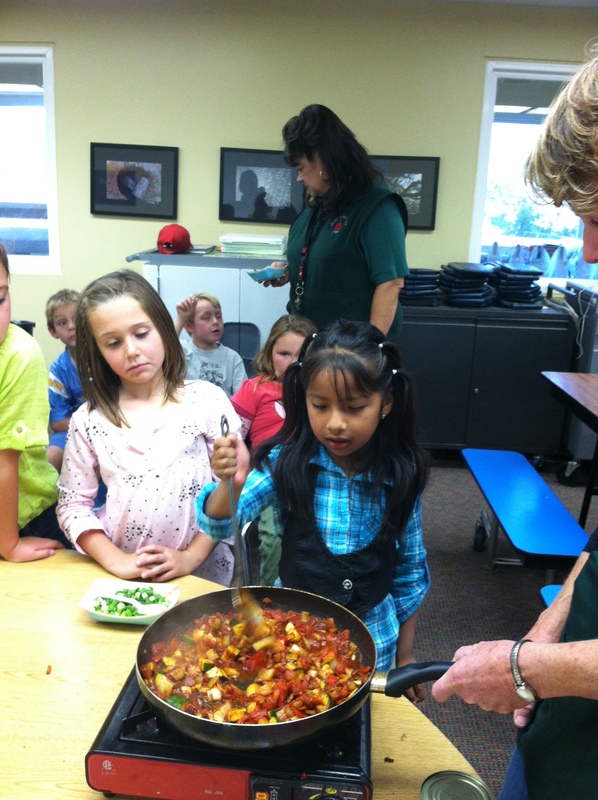 Chef Greg from Healthy Adventures Foundation enlisted students to help make lettuce wraps and flavorful tostadas. Across campus, Chef Jeremy Manley and Carie Quick talked with students about the new school lunch program (catered by Jeremy’s on the Campus) and had the students brainstorm new menu items. To tie it all together, Carmen Macias led a game in classifying edible plant parts, decorating a “My Plate” diagram with healthy choices and ending with a fitness activity. Many parents, Garden Beneficials and other dedicated community members generously gave their day to assisting at each workshop. 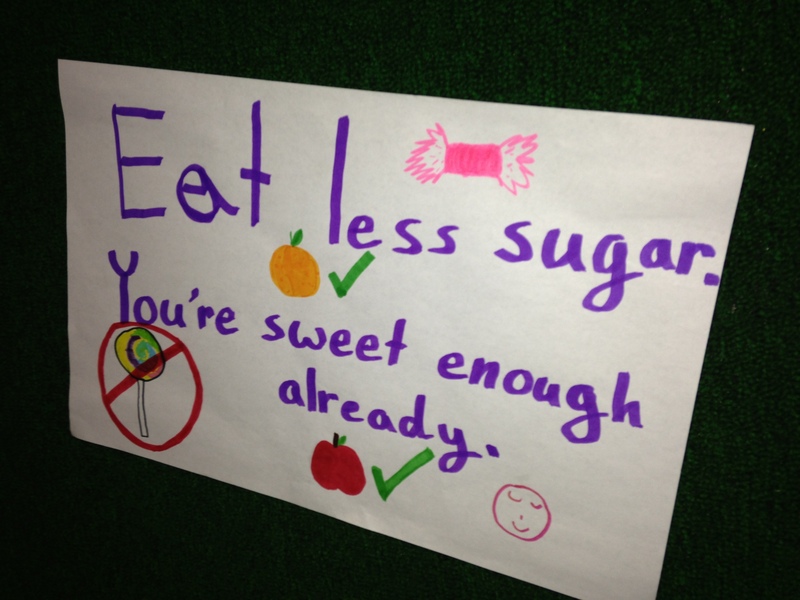 To add to this educational banquet, the campus was decorated with posters made by students in the weeks prior, promoting good food and healthy habits. At 11:00, students gathered on the playground for a scheduled exercise break led by Coach Dobby from the Julian Fitness Center. Just before starting, however, music came on the load speaker and Principal/Superintendent Kevin Ogden moved to the center of the campus, dancing. Teachers joined him from all directions, and the first ever flash mob at Julian Elementary was performed, appropriately enough to the song “We can change the world” on a day dedicated to making a healthier world for all of us! 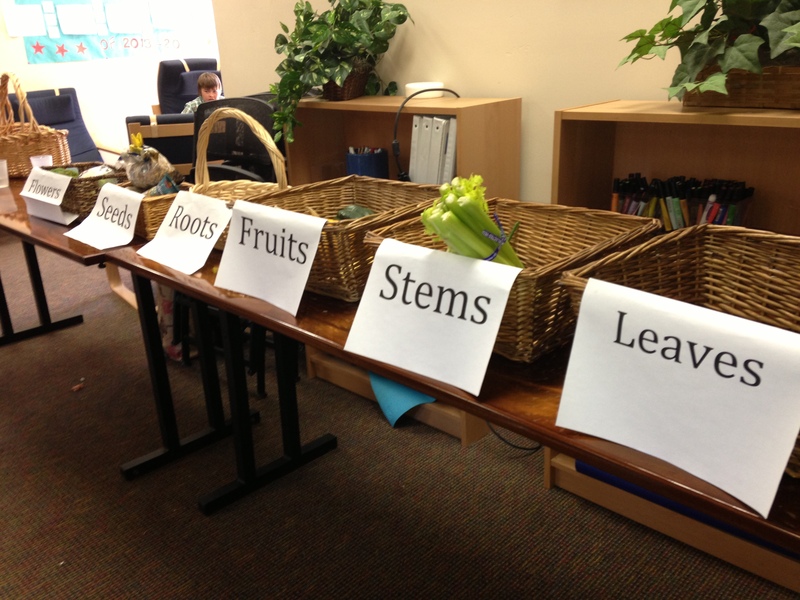 Celebrating Food Day was an idea generated by the school’s Farm to School Team as part of the year-long USDA planting grant awarded to the district and spearheaded by Pathways Executive Director Susi Jones. 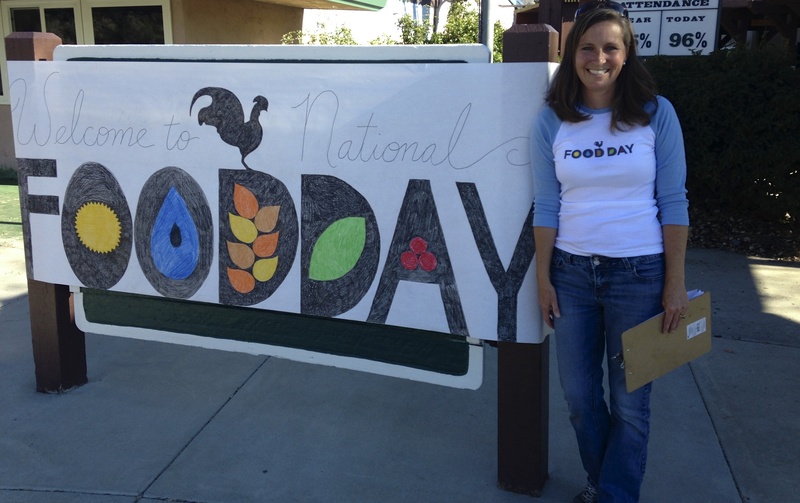 To learn more about National Food Day, or to begin planning activities for next year, please visit www.foodday.org and/or contact the Farm to School Coordinator Tricia Elisara for more information. Wait a minute….is that Gina VanderKam playing Garden Bingo? (On a visit from Washington, she was my right hand woman all day!) She is still trying to get the crayon off her fingers….